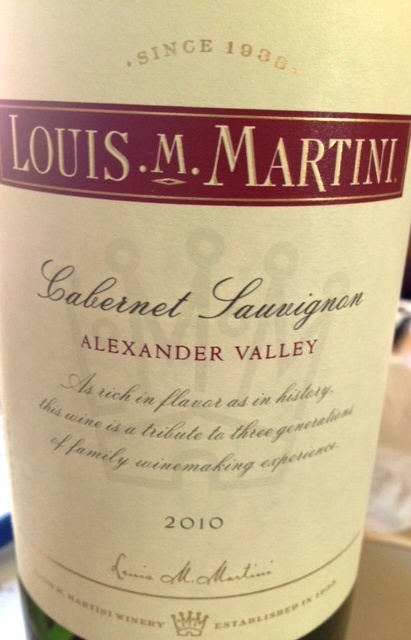 Last year, Louis M. Martini Winery celebrated 80 years in the wine-making industry, more specifically, in making distinctive cabernet sauvignon wines. Today, Martini wines are the first to be selected when included on wine menus in many restaurants, and I am no exception to ordering a bottle whenever I see it on the list. For every bottle I’ve ever had the pleasure to taste, Louis M. Martini wines have never disappointed me or my oenophile entourage. Especially the cabs. Crafted with grapes from the Eden of wine country’s Napa Valley, the smooth, velvet texture of this wine leads to earthy tones and an aroma of mocha delights. Enjoy this with beef roast or a plate of risotto with artichokes and mushrooms. I know I did. Kudos to the areas of Napa Valley where these grapes were harvested: Calistoga, Oak Knoll District, William Hill Estate Vineyard, Sage Canyon Vineyard and Ghost Pines Vineyard, and to third-generation winemaker Mike Martini for adding a bit of merlot, petite sirah, petite verdot and syrah grapes to enhance this wine’s complexity. This decadent dark purple Sonoma County cab offers a strong vanilla and undertone of leather, which is the essence of its time spent in the barrel. I enjoyed this with a plate of quinoa pasta and meatballs, but it would have been better with earthy dishes of wild game or red meats. Coming from a cooler than normal 2010 growing season, these grapes took their time to mature, which adds an intense flavor and tannin development. Enjoy,enjoy, enjoy. I brought this bottle of wine to a dinner party, where it was enjoyed with a serving of beef brisket, carrots, garlic mashed potatoes and great company. Everyone loved this cab and considered it to be perfection. The touch of merlot and hint of petite sirah adds to this wine’s dark fruit characteristics and structure. Perfection in a bottle.